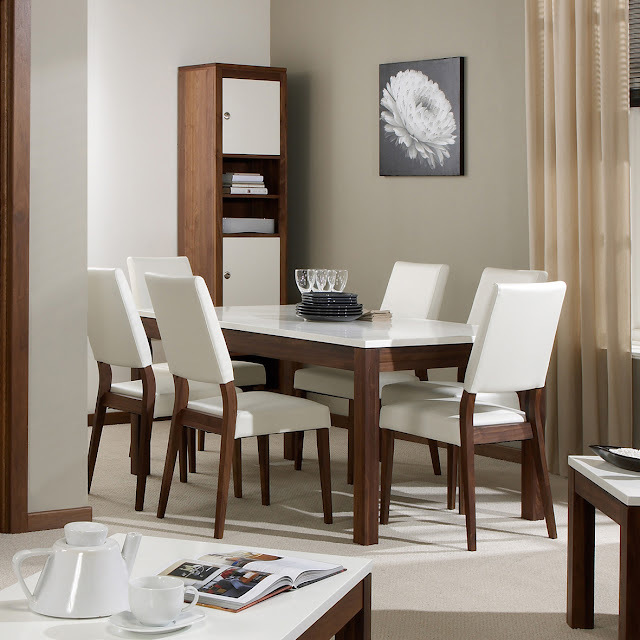 Furniture123 blog: Move over Oak: Walnut and White High Gloss furniture is where it's at! Move over Oak: Walnut and White High Gloss furniture is where it's at! It's true to say that oak furniture has real staying power and is still very popular in British homes. If you fancy a wood finish with a modern twist you can't go far wrong with the latest trend, walnut and white high gloss. Effortlessly contemporary, the Madilena walnut and high gloss bedroom range is all you could want. Supremely stylish, this range of furniture will help give your bedroom a relaxed look. With its expert use of materials, the Marlo Solid Walnut Collection really does stand apart from the mass of furniture available. By offering a fresh combination of solid walnut and crisp white accents a truly modern range is created. This series of products succeeds in being contemporary and streamlined while retaining a homely feel.